Did You Know? - Emma Townshend is the daughter of Pete Townshend from the band The Who. 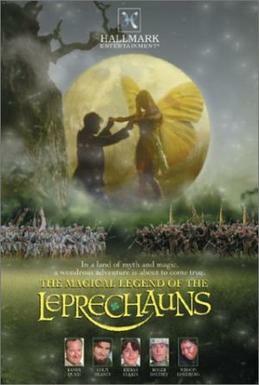 Roger Daltrey from The Who also played a role in the TV movie The Magical Legend Of The Leprechauns. Actor Kevin McKidd also had a role in the film, he is better known as Dr Owen Hunt in the television series Grey's Anatomy. My little cousin was born on 9th April and since I wanted to write entries that have something to do with her name 'Emma', I started looking out for actresses named Emma, singers named Emma, and films that have characters named Emma. It was then that I realised that although 2 of the biggest names in the film industry share the name 'Emma', I don't really know of many well known 'Emma's in the film and music industry! So I decided to get a little education about the name 'Emma' (God Bless Wikipedia). In the film industry, we have Emma Watson, made famous by the Harry Potter films (See the post The Perks Of Being A Wallflower), Emma Stone (whose real name is really Emily Jean Stone), Emma Roberts, niece of Julia Roberts (See the post Aquamarine), Emma Thompson, think Nanny McPhee and Professor Sybill Trelawney, and Emma Chambers (an English actress who played Hugh Grant's sister in the film Notting Hill). There are also fictional characters like Emma Pillsbury played by Jayma Mays from the television series Glee, Emma Swan, daughter of Snow White and Prince Charming played by Jennifer Morrison in the television series Once Upon A Time, Emma Morley played by Anne Hathaway from the film One Day, Emma Allen also played by Anne Hathaway in the film Bride Wars, Emma Dinsmore played by Kate Hudson in the film Alex & Emma, Emma Woodhouse from Jane Austen's book Emma (a role played by Gwyneth Paltrow in the 1996 film Emma), and the comic book character Emma Frost who has been played by actresses like January Jones in X-Men: First Class and Tahyna Tozzi in X-Men Origins: Wolverine. And in music there's of course Baby Spice Emma Bunton, Emma Hewitt, and Emma Townshend. I remembered a song from a TV movie I adored as a teenager The Magical Legend Of The Leprechauns - 'We Can Fly Away' by Emma Townshend. And I was thinking what an apt song it was for the TV movie. Emma Townshend's We Can Fly Away has a very uplifting and light-hearted tune that makes me smile every time I hear it. It has the perfect fairytale-like qualities to the music that not only fits the TV movie it was composed and written for but also the kind of music I love. It also helps that I really string instruments like the violin and piano. I love the sounds the violin and piano produces. While I could not find an official music video for Emma Townshend's We Can Fly Away, the video to the ending of the TV movie is also quite lovely to watch anyway. It's a HUGE spoiler though. So if you want, watch the TV movie first. The Eclectic Reviewer thinks... Emma Townshend's We Can Fly Away will make you feel as if you can really fly away and do or achieve anything. It's a romantic song that I might put on my list of songs I'd play at my wedding, provided I can find a clean copy without the dialogue from the TV movie. Plus, it really reminds me of the kind of Irish songs sung by The Corrs, a band I really love. So it's definitely a song that gets played a lot on my iPod.